Before booking an accommodation, two-thirds of all guests read online feedback written by other users - which significantly influences their booking decisions. 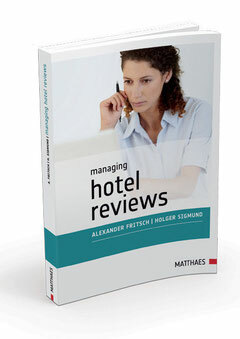 For this reason, experienced tourism experts Alexander Fritsch and Holger Sigmund have written a book in which they deal in detail with the topics of hotel reviews and the resulting online reputation of businesses providing accommodation. They investigate the following key questions: What are the opportunities and risks of online hotel reviews? What influence do reviews have on bookings and what are the best ways to respond to criticism? And last but not least: How can guest feedback be combined with quality management? Jam packed with examples and tips, full of clear explanations with numerous figures and tables, this book provides guidance for the professional management of guest reviews. It is an indispensable tool for hoteliers, as well as tourist and travel professionals who would like their business to profit from guest feedback.